As lovers of creativity, this year we have supported Brightons Photomarathon by giving money for one of the great prizes available to win. We are excited to see all the great creativity that Brightons photography enthusiasts have to offer! Running out of storage space for your music, video or pictures? This operation has no effect on your data and this is not a default reload. 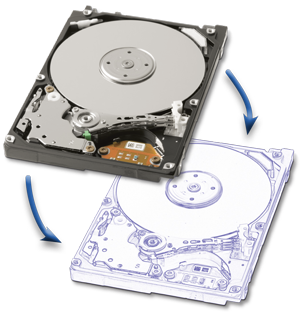 Both hard drive (original and new one) will be returned so you just need to fit the bigger one clearly marked by us and turn your laptop on and that is it !! It's simple, fast and efficient! You can send your computer or just your hard drive. The privacy implications on this will vary from social network to social network and will be dependant on the privacy settings you have chosen on these networks. We use Google Analytics - If you are anti-Google you can opt out of being tracked by Google Analytics at any time. You can usually switch cookies off by adjusting your browser settings to stop it from accepting cookies. Doing so however will likely limit the functionality of our's and a large proportion of the world's websites as cookies are a standard part of most modern sites. "It needs a new mainboard".......Does it? We hear this alot "another repairer said it needed a new main board". 60% of the time it means "we don't have the expertise to repair it"
30% of the time it means "we don't know what's wrong, so we're hoping a high price will put you off"
10% of the time it means "you actually need a new main board"
With these odds, it makes sense to get a second opinion. We repair mainboards down to component level, meaning reduced cost for you and faster repair times. If we can't repair it, nobody can! Few people know what the BIOS is and why it's important to keep it up to date so this seemed like a good time to tell you. The BIOS (basic input/output system) is the first piece of code that is run when you turn on your computer. It runs a quick self test and then identifies and initialises the internal hardware present. For example, keyboard, hard drive, DVD drive etc. The BIOS then allows software such as MICROSOFT WINDOWS to use the hardware. Where is the BIOS stored? The BIOS information is stored in an EEPROM microchip on the main/mother board. This means it is accessible even when there is no hard drive installed. Why is keeping the BIOS updated important? As the BIOS is the first thing that loads, if is corrupted, there is no way to access the computer. In addition, because the chip is mounted directly to the main circuit board the mother board sometimes has to be changed to correct the issues, leading to large repair bills. There are some computers that will actually fail completely if the BIOS is not kept up to date. Can I update the BIOS myself? Yes you can... but it is vital that you follow the instructions given by the manufacturers very carefully. To get the most up to date revision of your BIOS please refer to the website of your manufacturer. For example for SONY VAIO this would be www.vaio-link.com. Actually could I get an engineer to do it for me? You certainly can. We will update your BIOS and all your manufacturer / WIndows software for you safely and securely for £39.95 inc vat. This includes all costs and as usual there are no hidden extras. Just contact us for a collection or pop into our workshop in Hove. I'm concerned about sending my laptop away for repair! There are many laptop repairers around, and who to trust can be a tricky decision to make. There are possibly local repairers where you are that could help, there are many advertising a nationwide service, but who should you trust? In our opinion, you should look for a company that you can speak to before you commit to the repair. A company that will offer free advice on your computing problems. A company that works with known and trusted retailers such as John Lewis Partnership and Sony Centres, and has been doing so for 5 years and serviced over 15,000 laptops for individuals like you. Parts should be sources straight from the manufacturer brand new. You would be surprised how many of our competitors buy their parts second hand on eBay. Look for ISO9001 accreditation and you will be dealing with a company that has had its business methods independently audited and certificated. A good warranty is vital, and free post-repair technical advice to make sure you get up and running again fast. Most importantly, look for a company that understands the link between delighted customers and their success in business. One of the first questions we get asked is "how long will a repair take?". Well currently 98% of our repair work is completed within 5 days including collection. For local customers we can often offer a same day repair for screens and simple repairs. We understand that losing the use of your laptop is distressing and aim to get you working again as fast as possible. During recent reviews of our competitors nationwide, we discovered something surprising. You may not realise that when you trust your possessions to some repairers that they take no liability for loss or damage to your belongings whilst in their care. At The Laptop Hut we have full insurance covering loss or damage of your device, and strict data protection policies protecting your privacy. We believe that when your laptop has failed, you have enough problems without having to worry that it is in good hands for repair.